Women of Worth is a Lâ€™OrÃ©al Paris grassroots initiative that pays tribute to women across the United States who are making a difference in their communities through volunteerism. Beauty is not about vanity - it’s about our identity,” said L’Oréal Women of Worth honoree Alison O’Neil, as she addressed the room of beauty execs, celebrities and fellow honorees at the L’Oréal Paris Women of Worth dinner in New York Tuesday night. 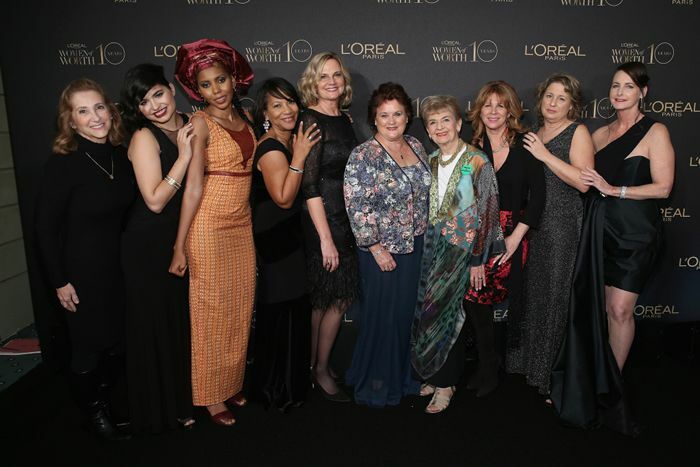 O’Neil, founder of the nonprofit Beauty Becomes You Foundation, which provides services such as facials and manicures to senior citizens, was one of 10 honorees being lauded at L’Oréal Paris’s 10th annual dinner. The Women of Worth program recognizes 10 women who have started grassroots charitable efforts in their communities, and awards them $10,000 each to fund their organizations. This year’s National Honoree, Schinnell Leake of Extra-Ordinary Birthdays, a Washington, D.C.-based organization that throws personalized birthday parties for children in homeless shelters, was granted an extra $25,000. The National Honoree is chosen via a public vote on the L’Oréal’s Web site. The night’s honorees were presented by a faction of L’Oréal spokesmodels and supporters, including Julianne Moore, Hoda Kotb, Freida Pinto, Mary Alice Stephenson, Eva Longoria, Karlie Kloss, Andie MacDowell, Ariana Huffington and Aimee Mullins. The mood inside the banquet hall at the Pierre Hotel was cheerful and celebratory, though emotions were running high, as video highlight reels of each organization’s work played before the honorees took the stage. “This is my first year [attending], and I’m fighting back tears,” said Karlie Kloss, onstage in a white Rosie Assoulin gown to introduce Maria Rose Belding, the 20-year-old founder of Means, a service that matches excess food with donation centers. As one presenter noted, promoting self-worth can be a challenge. “The first time I had to say ‘Because I’m worth it,’ it was actually hard,” said Mullins.